To study how the nitrogen is converted into various chemical forms by biological and physical processes. The Earth atmosphere comprises about 78% nitrogen in various forms in plant materials, rocks, soils, oceans, living matters and animals. Nitrogen is required by all living organisms, essential for many biological processes such as synthesis and incorporation amino acids, nucleic acids and proteins in living organisms. Nitrogen exists in the in the ecosystem mainly as organic nitrogen, inorganic nitrogen gas (N2), ammonium (NH4+), nitrite (NO2-), nitrous oxide (N20) and nitric oxide (NO). Most of the organism cannot utilize it has been fixed. Nitrogen Cycle is a most complex gaseous biogeochemical cycle in the ecosystem, which explains the transformations of nitrogen and other nitrogen-containing compounds existing in the nature. The process consists of a series of steps that converts the nitrogen gas to organic substance and converting these compounds back to nitrogen in the ecosystem. The cycle is mainly driven by some decomposers and other microorganisms and hence it has some biological influences in nature. The chemical structure of nitrogen gas makes it chemically unreactive in nature and large amounts of energy are required to break the triple bond. When a lightning strike in the biosphere, enormous energy is released and breaks the nitrogen molecules. The nitrogen atoms can then combine with oxygen in the atmosphere to produce various oxides of nitrogen, which are carried by the rain into the soil where they can be used by existing plants in the ecosystem. This process is known as Atmospheric nitrogen fixation. About 5–8% of the total nitrogen is only fixed this way. Apart from this, most nitrogen fixation is done by free-living or symbiotic bacteria. Such Nitrogen-fixing microorganisms can fix about 60% of nitrogen gas in the atmosphere. This process is known as Biological nitrogen fixation. 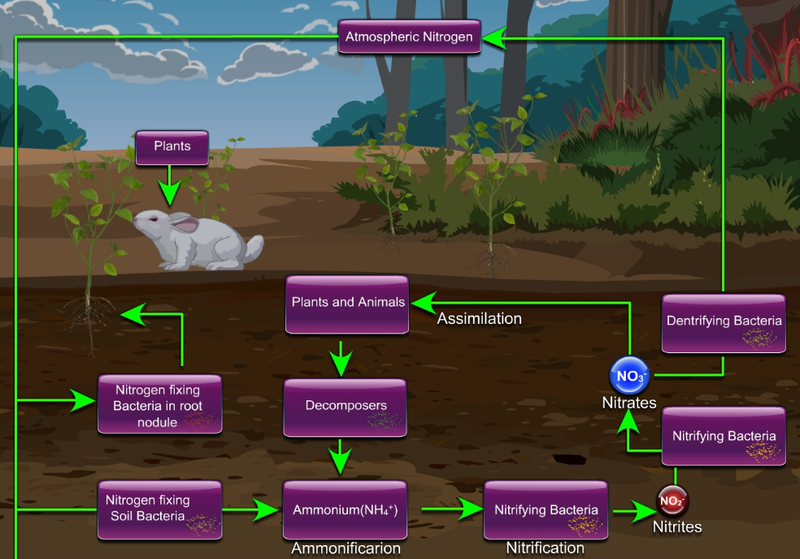 Nitrogen fixation is a process where N2 is converted to ammonium, since it is the only way for organisms to attain nitrogen directly from the atmosphere. Only a relatively few bacteria are able to carry out this reaction and they are termed as the nitrogen-fixing bacteria. Nitrogen fixing plants are termed as legumes. The bacteria of the genus Rhizobium have the ability to fix nitrogen through their metabolic processes. They often form symbiotic relationships with the host legume plants such as beans, peas and clover. Ammonia produced by the nitrogen fixing bacteria is converted to organic nitrogen, which is then incorporated as protein and other organic nitrogen compounds mainly by some soil microorganisms. Herbivores such as rabbits, cow etc secures their nitrogen compounds from plants and it circulates in their body to make their proteins and new cells. When these animals die, the nitrogen still exists in their body until decomposers take their action. Decomposers such as bacteria and fungi consume the organic matter and lead to the process of decomposition, where the nitrogen contained in the dead organism is converted into ammonium compounds, the process is known as Ammonification. Once ammonium is formed the further transformation into nitrates are carried out through the nitrification process. Nitrification, a step process, refers to the biological conversion of ammonium in the soil to nitrate. In the first step, the compounds such as the ammonia and Ammonium are converted to nitrites (NO2-) with the help of the bacteria such as Nitrosomonas. These nitrites (NO2-) are highly toxic to plants and animals in their higher concentration. Thus the nitrites (NO2-) are then converted to nitrates (NO3-) by the bacteria such as Nitrobacter. The nitrates can then be taken in by plants. This oxidation reactions release large amount of energy is released which can be utilized by the nitrifying bacteria to produce organic compounds from inorganic ions. Examples of nitrifying bacteria include Nitrosomonas, Nitrosococcus, Nitrobacter and Nitrosospira. The conversion of nitrates (NO3-) to primarily nitrogen gas, by the denitrifying bacteria, is termed as Denitrification process. This also derives lower proportions nitrous oxide gas. The denitrifying bacteria are mainly heterotrophic bacteria such as Pseudomonas, uses NO3- instead of oxygen in their metabolic processes. The nitrogen gas is then returned to the atmosphere. Typical examples of denitrifying bacteria include Micrococcus denitrificans, Thiobacillus denitrificans, Paracoccus denitrificans and Pseudomonas. Once the nitrogenous compounds are converted into dinitrogen, converted back to biologically available forms since the gas is rapidly lost to the atmosphere. This process balances the nitrogen fixation process in the ecosystem. Nitrogen is required for the synthesis of amino acids, nucleic acids (DNA and RNA) in chlorophyll molecules. It is an essential component of the proteins that build cell material, and plant tissue. Nitrogen is key element found naturally in manures and other organic fertilizers, hence a critical nutrient for plant growth. Nitrogen is necessary for the functioning of photosynthesis and for many enzymes that carry out various biochemical processes to assimilate nutrients.